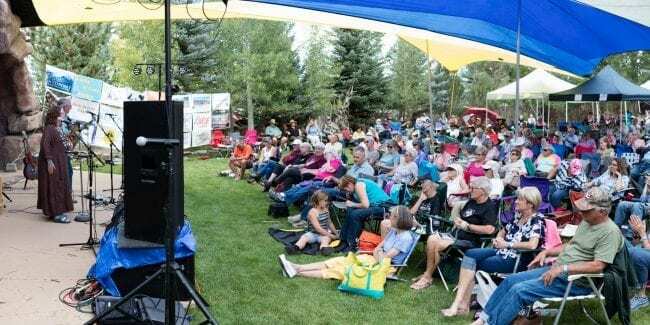 [High Peaks Music Festival in Westcliffe, CO. Photo: klzr.org] The southern Colorado town hosts this exciting music festival for another wonderful summer Saturday. The 10th High Peaks Music Festival hosts a great group of acoustic bands on stage at a beautiful amphitheater. This year’s event takes places on Saturday, September 14th, 2019. Westcliffe sits in front of one the state’s most stunning ranges, the Sangre de Cristo Mountains. The event goes on rain or shine at the Feed Store Park and Amphitheatre. The venue is partially covered, so bring your sunscreen, hats, jacket, whatever you feel for your typical September day at elevation. There will be a myriad of tasty food and beverages available, so no coolers are permitted. It’s also a smoke free location. All the festival proceeds go to support Wet Mountain Broadcasting Corp. Enter your email below and grab our free locals' guide and monthly what's up designed to help you live your Colorado life and uncover fun things to do. —and never miss out again. Disclosure: Uncover Colorado is a participant in the Amazon Services LLC Associates Program, an affiliate advertising program designed to provide a means for sites to earn advertising fees by advertising and linking to Amazon.com. Visit Mile High Happy Hour for Denver neighborhoods' restaurant happy hours. Vacation like a VIP! Leisurely Lifestyle shares life and travel hacks, as well as cheap luxury travel.